Thurs. 5 January: planned national shipyard strike called off by unions [T.6.1.84]; Land Rover workers vote to strike (but this is also later called off by unions). Mon. 9 January: Sarah Tisdall, a 23 year old civil servant, charged under the Official Secrets Act for leaking information to the Guardian last October about the arrival of cruise missiles at Greenham Common. Tues. 10 January: policeman shot dead in Newry, County Down. Mon. 16 January – miners walk out at High Moor colliery in Derbyshire in protest at visit by National Coal Board chairman, Ian MacGregor. Mon 16 January – 19,000 workers stage one day strike at Britain’s eleven Royal Ordnance factories, in protest against plans to privatise them. Tues. 17 January: Parliament passes rate-capping bill, giving Government powers to intervene to control spending by local Councils. Tues. 17 January: 200 workers walk out at Volvo bus and truck plant in Irvine, Ayrshire in pay dispute. Wed. 18 January: the national council of print union National Graphical Association agrees to purge its contempt of court in the Stockport Messenger dispute, effectively ending support for the dispute, which started in July 1983 with the dismissal of the ‘Stockport Six’ for striking at the newspaper owned by Eddie Shah. Wed. 18 January: James Prior, Secretary of State for Northern Ireland, announced a public inquiry into the child abuse scandal at the Kincora Boy's Home in Belfast. Thursday 19 January: police clear protestors from Bracknell Town Council meeting after 200 protest against threat to close Easthampstead Adventure Playground and East Lodge Play Centre. The next dday users and staff occupied both places and staged a roof-top demonstration. Thurs. 26 January: The Hennessy Report, into the mass escape of 38 Republican prisoners from the Maze Prison on 25 September 1983, was published. Most of the responsibility for the escape was placed on prison staff. James Prior, then Secretary of State for Northern Ireland, stated that there would be no ministerial resignations as a result of the report. Thurs 26 January: News International - publishers of the Times - dismiss 750 members of SOGAT 82, for taking part in a two week unofficial sympathy action in support of clerical staff striking over staffing in the library. The Times failed to appear for four days. Thurs 26 January: tens of thousands of civil servants in DHSS offices and other workplaces walk out in protest at GCHQ ban. Thurs 26 January: students occupy the library at Strathclyde University in protest agains changes to travel allowances for students. Fri 27 January: workers occupy the Henry Robb shipyard, where 390 jobs have been cut as a result of decision to close: ‘A Royal Navy sub-marine, under repair at the yard, will not released by the men’ (GH 28.1). Sat 28 January – 20+ women stage a Reclaim the Night walk in Reading. Mon. 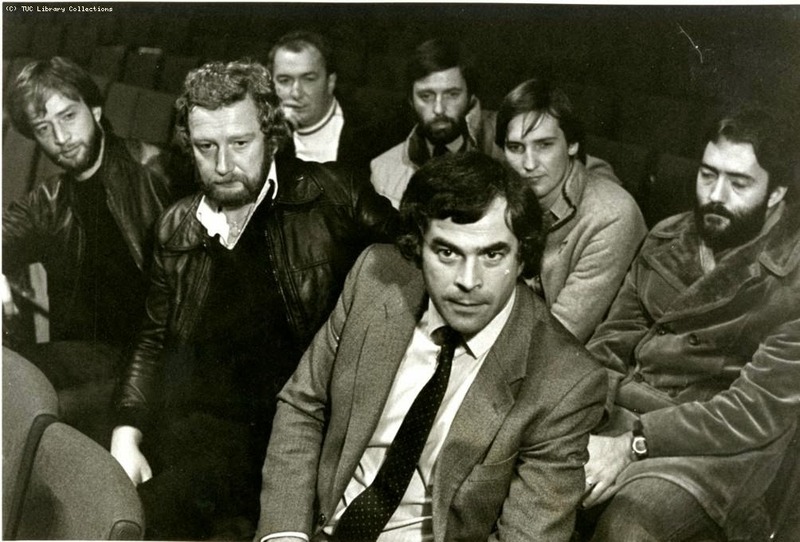 30 January : The Prison Governors' Association and the Prison Officers Association both claimed that political interference in the running of the Maze Prison resulted in the mass escape on 25 September 1983. Nick Scott, then Minister for Prisons, rejected the allegations. Tues 31 January: Two Royal Ulster Constabulary (RUC) officers killed in an Irish Republican Army (IRA) land mine attack on their police near Forkhill, County Armagh (GH 1.2). 1000 demonstrate in the snow at new Hazleton vivisection laboratory in Harrogate; fences are pulled down and police snowballed (SO). 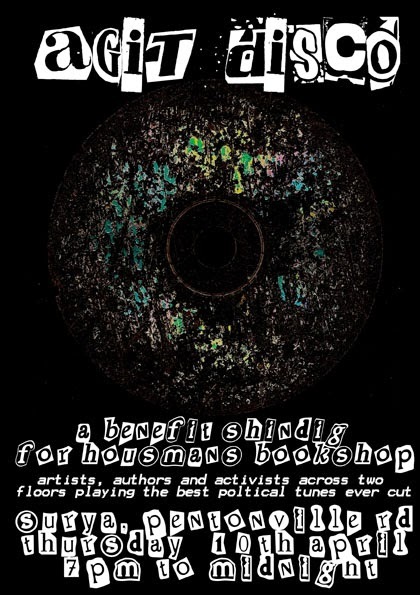 'We’d like to invite you to come along to a special fundraising DJ shindig, being put on by Housmans alongside the good people involved with the Agit Disco book (Mute Books 2011). We’ll be taking over both floors of local eco-music venue Surya, and filling it with guest selectors who featured in the Agit Disco book. The music policy on both floors will be nothing but the best politically-charged tunes ever recorded. Sian is a photographer and photo editor. Whilst researching her MA dissertation Sian looked into the history of the Welsh Not and became further interested in the oppression of Welsh Identity. Sian is a non-Welsh speaking Welsh person from Swansea. Co-manager of Housmans bookshop, and weekend producer and deejay. Artist, writer, prankster, film maker, occasionally even a musician etc. His many books include ‘Cranked Up Really High: genre theory and Punk Rock’ Codex 1996. Home’s own punk slop can be found on the music CD ’Stewart Home Comes In Your Face’ Sabotage Edition 1998. Writes regularly for the papers Variant and Freedom. Many intriguing analyses of film, television, art, music and writing, with a deep insight into the workings of oppression. e.g. ‘Beautiful Struggles and Gangsta Blues’ [urban music review of the year 2004]. Variant, 22, February 2005.